But instead, we're hunkered down inside, piled with blankets as the most recent cold front rocks our world. I read this book in one day. 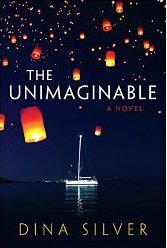 The Unimaginable, By Dina Silver. Yes, it's a romance novel... but not like the countless zillions of others. This story was inspired by a sailing family, and the unimaginable events of a real life attack by Somali Pirates back in 2011. One of the questions Cruisers hear so often is "Aren't you afraid of PIRATES???"... For me, this story does not trivialize the seriousness of this real life hazard to those who choose a life at sea... The fictional story takes these events and weaves them into a more palatable and less horrible tale that allows us to glimpse how it might be, should the unimaginable happen. The story is about a small town girl who turns life events into catalysts for change. She leaves all she holds dear and finds a new life for herself in foreign lands. She takes a chance on a sailing adventure and nearly loses her life... for the rest, you'll have to read it yourself. I only share the books I consider "noteworthy" and this one is definitely different from the rest.